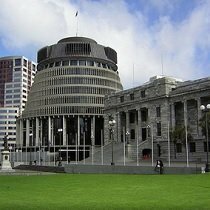 Government TV Channel / Legislative broadcasters in New Zealand are broadcasters of the New Zealand Parliament House of Representatives. Television channel Parliament TV and radio network AM Network are funded by the New Zealand House of Representatives to broadcast full and unedited coverage of its proceedings. The Office of the Clerk also funds a fully independent written, audio and video political reporting service of Parliamentary proceedings called Parliament Today.